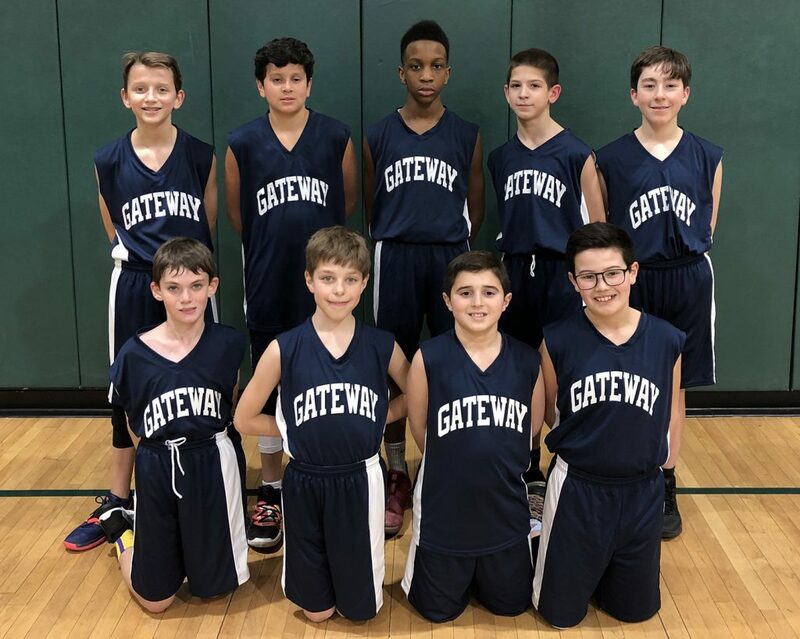 The Gateway boys JV basketball team completed the first undefeated season in school history by beating City and Country School Wednesday evening in the Middle School Athletic League’s championship game! Advancing to the championships for the first time since winning the league title back in 2012-2013, the Lions took an early lead in Wednesday’s match and maintained their position throughout the game, winning 48 to 26 and making school history in the process! The players had a terrific season, came together as a team, and consistently worked hard to accomplish this incredible feat. A special thanks to Coach Joel Perez and Assistant Coach Genaro Cruz for their leadership, direction, and enthusiasm which helped make this season so successful. And congratulations to the boys on a truly historic year! Thursday was Spirit Day at The Gateway School! 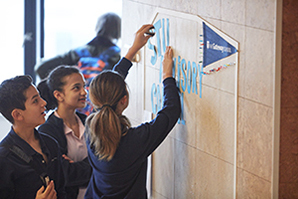 Middle and Lower School students showed their school pride by wearing blue and white. 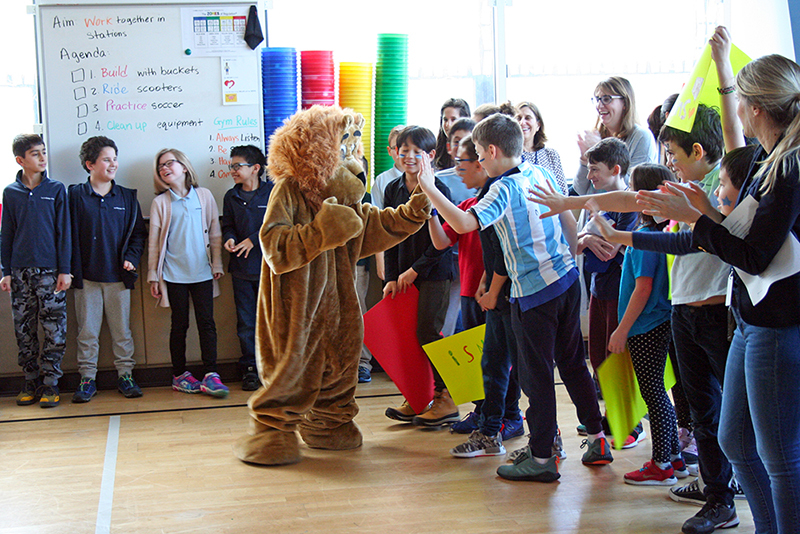 Lower School classes created colorful class banners, designed Gateway lion posters, and even made paper lion manes! The Middle School students organized a pep rally, complete with team challenges and relays. In a round of basketball knockout with students against the faculty, it came down to Director of Middle School, Eleni Siderias, and 8th Grade Class President, Hudson C. At the last moment, Ms. Siderias made the final basket to win the knockout challenge for the Gateway faculty! Check out our social media pages for more photos and videos from a fun-filled, spirited day. Go Lions! 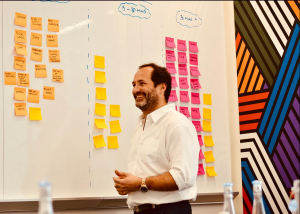 In a recent Professional Development workshop led by Nick Propper, an accredited coach with the Johnson & Johnson Human Performance Institute, the entire Gateway faculty and staff learned about stress and resilience. Nick shared research-based methods on how to better manage our energy in addition to our time. Gateway faculty and staff walked away with a clearer understanding of the different types of stress and how to build resiliency through productive recovery methods. Thank you, Nick! You can learn more about the wonderful work he is doing at www.abouttomorrowpeople.com. 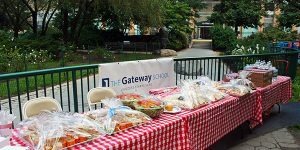 On September 5, Lower School families came together to celebrate being back to school with the annual picnic at West End Towers Playground. It was wonderful seeing families enjoying each other’s company and starting off the year with energy and excitement! 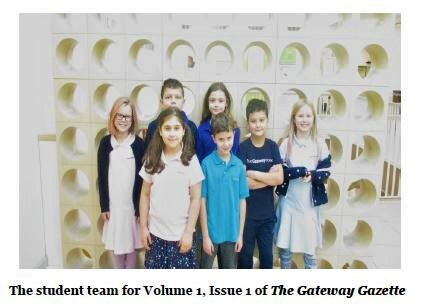 We look forward to continuing to build our Gateway community this year. Thank you to those who participated and a special thanks to our PA organizers and hosts: Helen Brown, Heidi Bonilla, Jennifer Serrano, and Monika Wyszomirska. 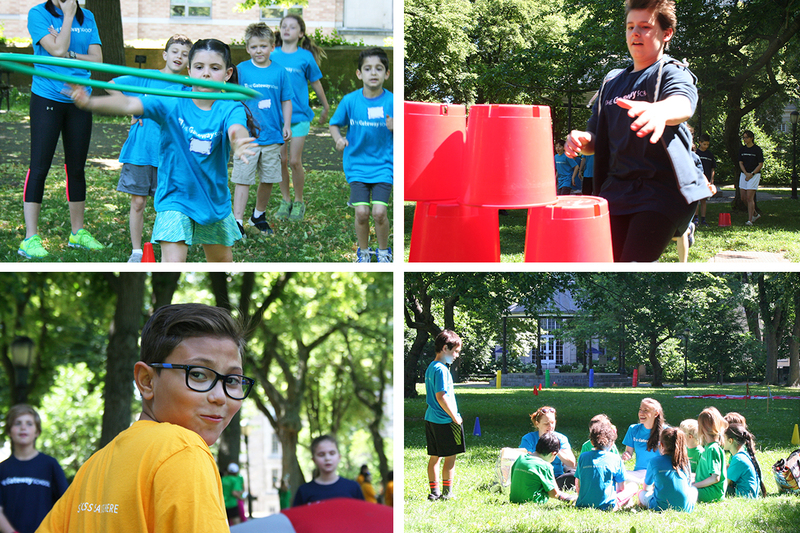 On June 14, the entire school enjoyed the 10th annual Field Day under sunny skies in Sakura Park. 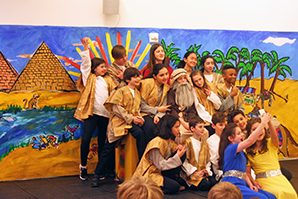 In April, a group of Lower School students took a field trip to Ellis Island and the Statue of Liberty, as part of their Social Studies unit on immigration. The 7th and 8th grades took a field trip to the Google offices in Manhattan. In February, the Middle School held a pep rally to celebrate our boys' and girls' basketball teams. Go Lions! 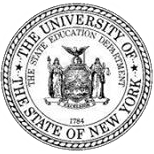 As part of their Humanities class, the 6th grade took a field trip to the U.S. District Courthouse in lower Manhattan. The School Store was open for business during Grandparents and Special Friends Day. Thank you to all the parents who volunteered! Middle School students take a weekly fitness class at a nearby CrossFit SPOT facility. On Oct. 27, Lower School classes met a guinea pig, gerbil, rabbit, and more from Art Farm in the City. On Oct. 17, students in grades 5-6 visited the Whitney Museum to see an exhibit of Alexander Calder's art. On Oct. 12, the 6th grade took a field trip to Pier 84 to learn about the Hudson River estuary. Students enjoy a "sensory gym" on select days. At Curriculum Night, parents hear a highly informative series of presentations on what students will be learning during the course of the year. The Back to School Cocktail Reception on Sept. 28 brought together parents, faculty, staff, and trustees for an enjoyable evening at the outset of the school year. Class 637 visited the Head of School's office as part of their exploration of the school. 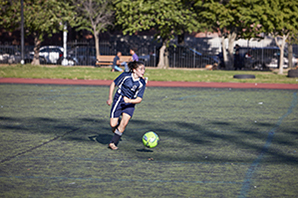 Middle School students enjoy gym class at a regulation-size facility in nearby John Jay College. The Directors of Lower School and Middle School held a New Parent Orientation on the first day of school.